What an amazing feeling it is to support a great cause like the Wounded Warrior Project! Another year and another extremely successful day raising money for the Heroes of our nation… I wanted to give a huge thank you to everyone who played in the World’s Largest Golf Outing here at Flanders Valley! Also a very special thank you to Team Parnell, our highest fundraising team. 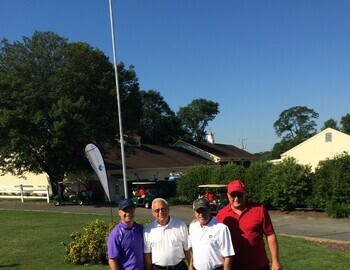 Capitan Perter Parrinello and playing partners Frank Pecht, Bob DiNatale, Vincent Labarbara raised a total of $3015!! All together the teams that played raised a total of $6,592 with an additional $2882.90 raised the day of the event! Capping off Flanders Valley Golf Course's donation to the Wounded Warrior Project at $9474.90! This was just a small piece of the $1,013,879 raised but we are very proud to be a part of the action. Also wanted to give a big congratulations to team Three-putt our lowest scoring team who shot 58 to take the cake! We truly appreciate all the support everyone has shown for this great cause and we can’t wait until we can do it again next year! Mark you calendar’s now, first Monday in August will be a day filled with fun, food, and most importantly support for our warriors! See you then!